Are you in the mood for some chicken? If so, you’re in luck! 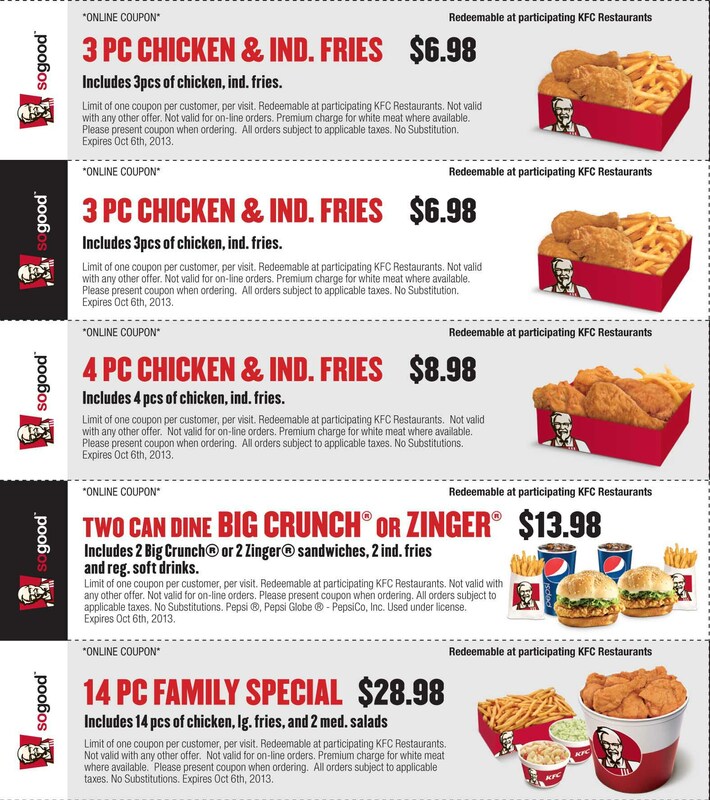 You can get your chicken and a whole lot more with this KFC MULTIDISCOUNT COUPON SPECIAL. That’s right! 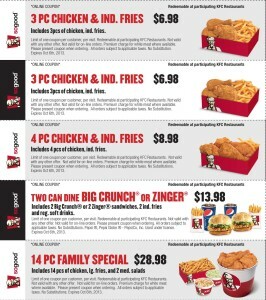 KFC is practically giving away their chicken with all these discounts – and they are online coupons! You have a variety of choices – 3 pc. chicken and fries, 4 pc. chicken and fries, Two can Dine Big Crunch or Zinger, or a 14 pc. family special which includes 14 pieces of chicken, a large fry and 2 medium salads for $28.98. You can’t beat that if you wanted to! That’s a winner. KFC has been around for quite some time, when they used to call the restaurant Kentucky Fried Chicken. It’s been a very long time but now they are rebranding and passing on the joy to the customers with loads of coupons like these. If you’re needing a snack or heading out for a road trip, KFC has always been a tried and true go to place for all of the fixings you could possibly need for an inexpensive price. With all the new restaurants popping up, it’s good to have a fallback and KFC is just the place to go when you need that rotisserie, crispy or original recipe. They have fed many families and continue to do so. Picnics? Go to KFC. Major outings? Go to KFC. You can get a whole lot with a little. That’s what they call bargain shopping at it’s finest. String beans, coleslaw, corn, mashed potatoes, fries and even dessert. 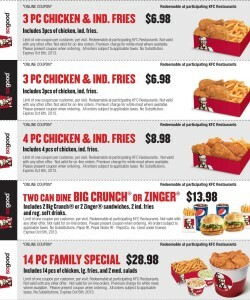 You don’t have to think about going any other place than KFC to get an entire meal that can last more than one day. Don’t feel like cooking? They’ve got you covered! Head on down to KFC – finger lickin’ good!